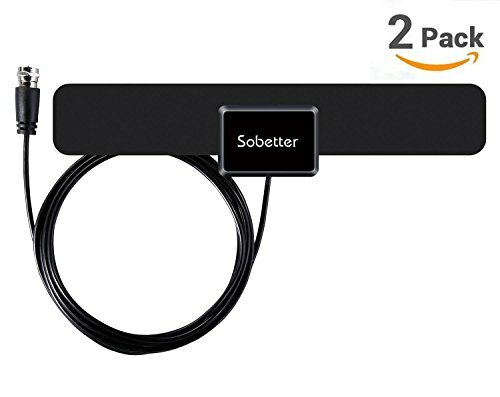 Sobetter HDTV Antenna from your home to bring you the most popular TV shows, news and sports, on both network and local television in full 1080 HD - for FREE. Before you buy, visit "antennaweb.org" or "antennapoint.com" check how many broadcast towers surrounding you within 35miles. STEP 1: Stick the antenna on the window/wall/door. Each time you reset the antenna,please scan TV programms again. 5. If your TV has no built-in tuner, you can add an ATSC digital converter box to receive the HD signal. 6. All of our antennas have a 12 months warranty. If you are not satisfied with the amount of channels you are receiving, please contact us so we may immediately assist you and help to solve any problems you have. Mini Size and High Performance - Extremely soft design and lightweight. You can either hide it behind the TV, lay flat on table or stick it high on window(it can stand moisture weather and exposure to sunshine). Never Pay Your Cable or Satellite For Television Again! Sobetter antenna can pull in all of your local news, weather, sitcoms, kids and sports programs absolutely FREE. Just connect it to your television and let the antenna do all the work. Your cable company doesn't want you to know this, but you can still get lots of channels right over the air and for free. The signal of the 35miles is mainly available in the range of 30-40miles. Quality of reception may vary by channel depending on distance from broadcast tower, terrain, and other factors( Warm Tips:Before you buy, please visit:antennapoit.com to find out what channels are available in the range of 30-40miles).